Lizzy Ross, Major & the Monbacks play Saturday! 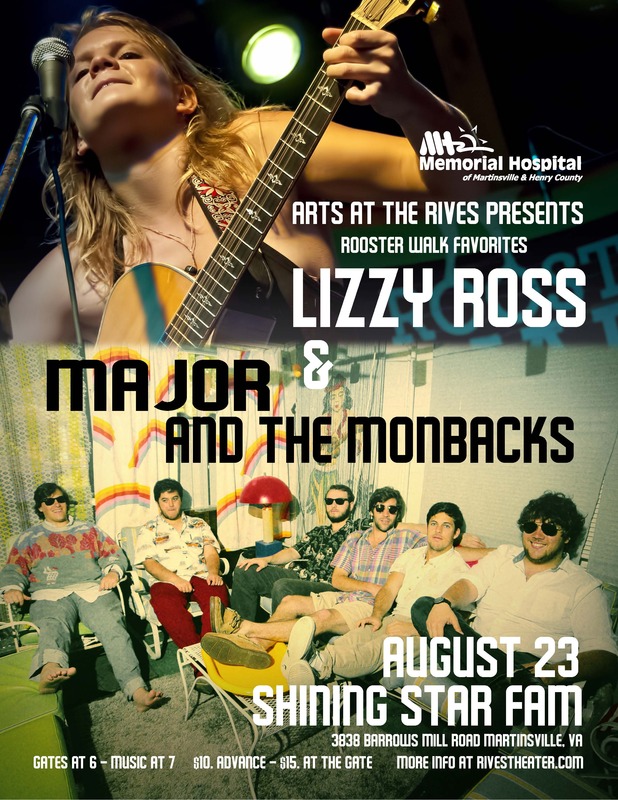 Join us Aug. 23rd for a fantastic co-bill at Shining Star Farm that will feature Lizzy Ross, followed by Major & the Monbacks! Lizzy has been a Rives Theatre and Rooster Walk favorite for years! Check out all the latest HERE. Major & the Monbacks are an awesome “rock’n’soul” band from the Norfolk area, and they stole the show Thursday night at Rooster Walk 6! Learn more about this full-sized rock band (complete with horn section!) HERE. This outdoor show is always the best party of the summer in Martinsville/Henry County. Shining Star Farm is located at 3838 Barrows Mill Road in Martinsville. Please feel free to bring lawn chairs and blankets. Outside alcohol is not permitted. Buy your tickets today and SAVE money. Just click HERE for online tickets. To learn more about group-ticket-sales options, email rivestheater@gmail.com. Tickets are available at Woodall’s Music and the Daily Grind. ← Sweet Crude plays tonight! !